Almost all of today’s most popular diets are low-carb, high-protein. Atkins has been big for decades; Paleo is an ever-expanding movement, thanks in part to its following of cross-fit fans; and other plans like Dukan, Medifast, and Southbeach aren’t got anywhere anytime soon. But, while this eating formula may result in noticeable weight loss for most folks, a new study, profiled in a Huffington Post article, suggests high-protein diets may also shorten your life. That’s a pretty big deal. Diets that are high in protein and low in carbohydrates help the body shed fat. There are two main reasons for this: Protein is harder for the body to digest than other nutrients so you automatically burn extra calories as you digest and metabolize it. Also, proteins are more filling than many other types of food. Eat a bowl of pasta and you may be hungry again within the hour. Eat a chicken breast and you may forget to eat your snack. Proteins can come from animal or plant sources. This new study, from the University of Southern California’s Davis School of Gerontology, says that plant proteins—such as those coming from nuts, beans, and lentils—are fine. But eating a high amount of animal proteins—which the study defined as 20-percent or more of a person’s daily calorie intake—may throw your daily diet out of balance and into an unhealthy place. You may miss out on a lot of other important nutrients for whole body health—like fiber—and also get way too much of others that are unhealthy in large doses, like saturated fat. What’s the damage? 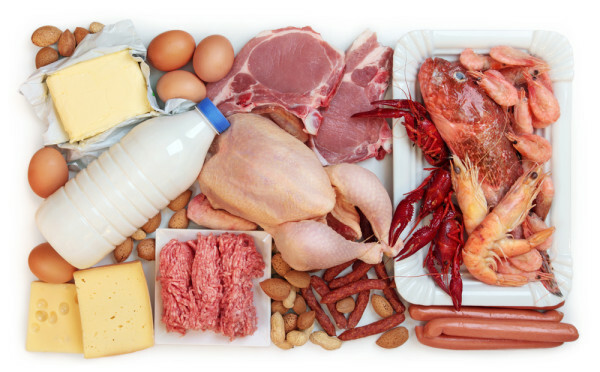 Following a diet high in animal proteins can raise a person’s risk of death by 74-percent. Eek! This increased rate of mortality is from all-causes, but heart disease and cancer are of particular concern for big-time carnivores. The researchers behind this study say that a following a high-protein diet during middle-age, in particular, can increase a person’s risk of dying from cancer to that of a smoker. And, who could ever forget that Mr. Atkins himself had a history of heart attacks. This risk seems to be age-dependent. While the researchers suggest low-protein (around 10% of daily calories) during middle age, for people over 65 a high-protein diet may be beneficial. In this study, it appeared that people in this 65+ age bracket who followed a moderate- to high-protein diet were actually less susceptible to disease. Moral of the story: Moderation in all things, especially animal proteins, is recommended. If you are still gung-ho for a high-protein diet, do your body a favor and eat more plant proteins.